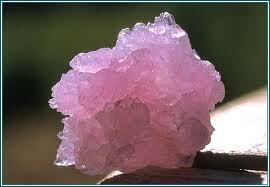 Law of attraction, power of thoughts,subconscious mind, spirituality: Seek the help of Rose Quartz to calm your mind. Seek the help of Rose Quartz to calm your mind. I am an emotionally well balanced woman. Though serious, I take things lightly and move on. None can hurt me or make me feel inferior. Having said all that, most of the people who know me inside out stay at their arms length from me. It is a sign that many men and women in the world can't stand outright honesty and shocking frankness. I am sure you are wondering why I am saying all these? You see, yesterday, after 10 PM, a stranger rang the door bell, silently handed me a small jewel box and bide adieu. I gingerly opened it to find a crystal of Rose Quartz. It is said to be an emotional healer apart from curing heart ailments. Another unique quality of Rose Quartz is it helps one release repressed emotional wounds. What does it all mean? Am I having repressed hurts without my knowledge buried deep in my subconscious mind? Hmmm... let me see what the Rose crystal brings out of me.